We are proud to announce that our founder and CEO, Maya Hess, will be the recipient of the Graduate of the Last Decade (GOLD) Award for her humanitarian and educational work on behalf of linguists at risk. Maya received her PhD in Criminal Justice from the CUNY Graduate Center, focusing on translators and interpreters who operate in the terrorism arena. Red T is her dissertation in action. 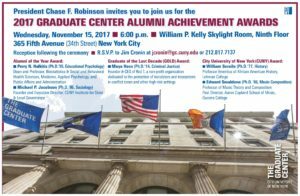 Please join us for the award ceremony and reception by RSVPing to Jim Cronin at jcronin@gc.cuny.edu.